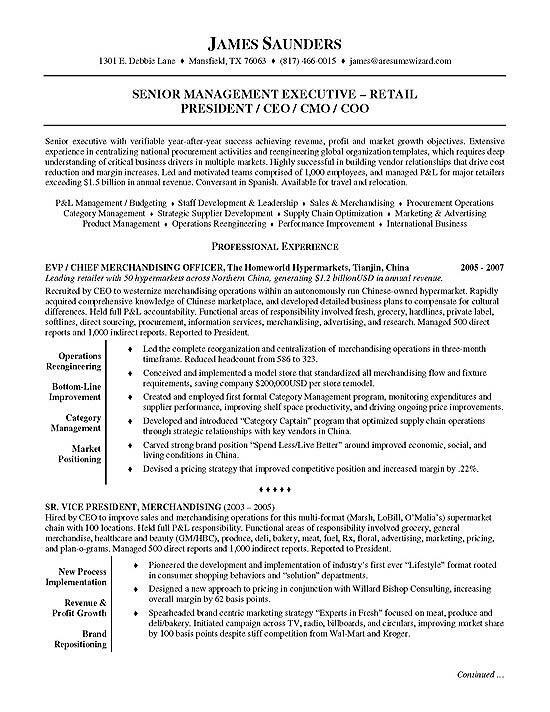 Example of resume for retail executive with previous positions leading large multi bullion dollar corporations. The document works as a good resource for anyone in high level positions within corporate retail, restaurant or consumer goods. The resume uses a job title headline to identify the candidate as a Senior Management Executive with history as CEO, CMO and COO in retail companies. The headline is followed by a summary paragraph that emphasizes achievements in revenue increases, cost reduction, profitability and market growth. The summary also identifies the scope of job seeker’s responsibility by documenting their history of managing 1000 employees for $1.5 billion retailers. The introduction is followed by a list of key strengths such as budgeting, sales, procurement, supplier development, supply chain, marketing and international business. The professional experience section states the job title, company and dates. A brief statement in italics describes the company. The paragraph provides information about the major responsibilities at each job position. The writer then uses bullet points to document specific accomplishments within each company. A formal section on professional affiliations and education is used to conclude the resume. Managing large retail change presents challenges that are represented by constant change. A competitor can go out of business and then a new one comes up and replaces them. There will always be someone to compete with for market share. As a retail executive, you need to demonstrate that you can market products, produce sales revenue, increase margins, adapt to change and aggressively build market share. The resume above uses a unique and effective technique to make their accomplishments stand out. The writer lists the type of achievement next to the bullet points such as market positioning or bottom line improvement. This helps to highlight the success in operations, category management and revenue and profit growth. Anyone reading the resume can quickly realize exactly how this executive can impact a new company. This technique can be applied to each job and each accomplishment. 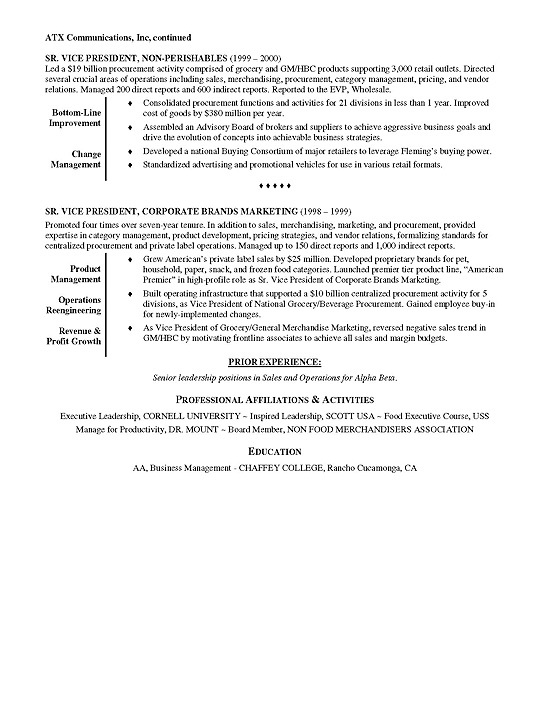 Retail Executive Resume Example By Career Wizards Inc.